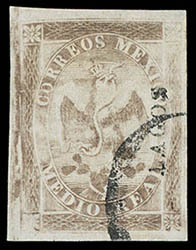 Mexico, 1864, Eagle (1st Period), ½r brown, Chalco, boxed Xonacatepec cancel (Schatzkes 98), F.-V.F., with only 50 sent, a rarity. Scott No. 19 Estimate $400 - 600. 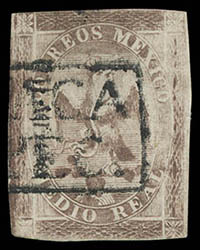 Mexico, 1864, Eagle (1st Period), ½r brown, Chalco, boxed Xonacatepec cancel (Schatzkes 98), Fine, with only 50 sent, a rarity. Scott No. 19 Estimate $250 - 350. 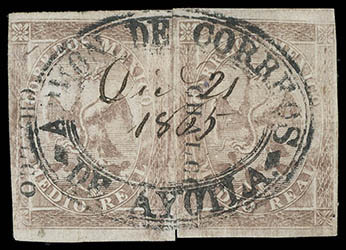 Mexico, 1864, Eagle (1st Period), ½r brown, Chalco, rejoined horizontal pair (two singles), central virtually complete strike of Ayotla oval cancel (Schatzkes 92) with 1865 manuscript date, faint pressed crease in left stamp, Very Fine and choice appearance, very rare with only 50 sent, Pietsch values "J" ($1,000-2,000). Scott No. 19 Estimate $1,500 - 2,000. 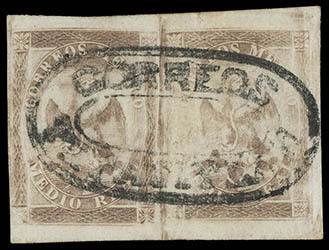 Mexico, 1864, Eagle (1st Period), ½r brown, Cordova, boxed Huatusco cancel (Schatzkes 196), small corner thin, Fine appearance, still a very rare stamp. Follansbee No. 17 $900. Scott No. 19 Estimate $200 - 300. 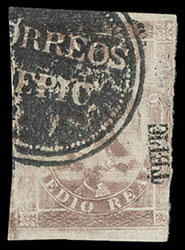 Mexico, 1864, Eagle (1st Period), ½r brown, Guadalajara-Tepic, negative Tepic cancel (Schatzkes 416), Very Fine. Follansbee No. 17 $250. Scott No. 19 Estimate $150 - 200. 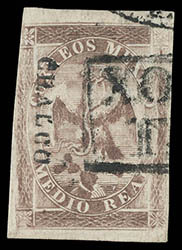 Mexico, 1864, Eagle (1st Period), ½r brown, Lagos, Lagos mute "O" cancel (Schatzkes 666), large margins, horizontal crease, Extremely Fine appearance, very scarce with only 200 sent (NF $800). Scott No. 19 var. Estimate $600 - 800. Mexico, 1864, Eagle (1st Period), ½r brown, without district overprint (Lagos), horizontal pair, complete strike of oval Tepatitlan cancel (Schatzkes 695), clear to mostly huge margins, Very Fine and choice, a very rare and attractive pair, with only 50 sent (NF $1,700). Scott No. 19b Estimate $1,500 - 2,000. 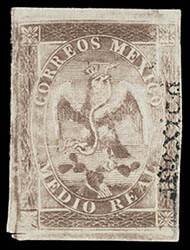 Mexico, 1864, Eagle (1st Period), ½r brown, Mexico, without gum, Very Fine. 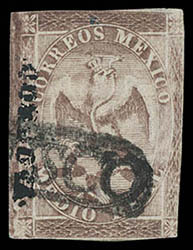 Mexico, 1864, Eagle (1st Period), ½r brown, Queretaro, margins huge to just in at two sides, in combination with 1864, Eagle (2nd Period), 1r ultramarine, cons 171-1865 + 1864, Eagle (1st Period), 8r red, two horizontal strips of three on reduced front (large piece) to Guanajuato, all tied by Queretaro boxed date stamps (Schatzkes 1262); preuse folds in piece do not affect stamps, Very Fine, an extremely rare tricolor high value franking from Queretaro. Scott No. 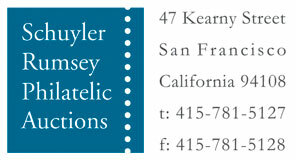 19+22+25b Estimate $10,000 - 15,000. THE ONLY KNOWN 1864 ½R EAGLE ISSUE FROM THE FIRST PERIOD USED ON PIECE. 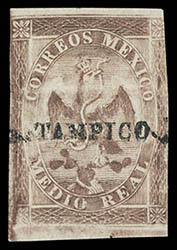 Mexico, 1864, Eagle (1st Period), ½r brown, Tampico, full o.g., bright and fresh, F.-V.F. ; with 1981 M.E.P.S.I. certificate. Follansbee No. 17 $350+.